Tested out a new spice rub from the group over at Oak Ridge BBQ for this steak - their coffee crust was spot on! If you can't wait for them to ship ya their secret family recipe, check out some of the other kicking coffee rubs on the market. Williams-Sonoma has a decent espresso powder that you can add some savory seasonings too to make a good at home version of this steakhouse favorite. While the grill is coming to temp, and the grate is cleaned and oiled, prep your salad and steak. Everything fires while the steak rests for perfect timing to serve as a whole platter to let your dinner guests create their own plates. Meanwhile, rub the steak with a thick coat of the coffee rub. When ready, grill for 12 to 14 minutes, a temp of about 140 for medium rare, flipping once half way through. Wrap in foil and allow to rest. Rub the sliced avocado and Romaine lettuce in olive oil and sprinkle with salt and pepper. Place on the cool side of the grill and grill until nice and charred on all sides, 3 to 5 minutes. Whisk the vinaigrette ingredients together in a large bowl, season to taste, and toss the sliced tomatoes, peppers, onion, and mushrooms in the vinaigrette. Arrange the grilled vegetables to a large platter and top with the sliced veggies, and vinaigrette. 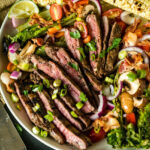 Slice the flank steak, against the grain, on an angle against the grain and place over the salad. Sprinkle with crushed bacon, scallions and cilantro for a pop of color. Serve and allow people to create their own platter.